I will be defending my thesis next Wednesday in front of the panel of examiners as well as the public (mostly made up of friends and labmates which will be nice). Of course presenting at the conference was a wee bit of practice for the defence, but more was needed. I was actually preparing the defence talk at the same time as my conference one, so I was able to give the defence presentation a couple of times informally when traveling. Upon my return, I gave a practice talk to my labmates, who gave me some helpful pointers (although I must admit I now feel that I am at a point where I want to ignore some suggestions in order to stay true to my own style and the goals I have set out for my presentation). I think the weakest area of my talk, as of last week anyways, are my transitions between chapters (which my lab helped me see of course). Usually I tend to write out my important talks to practice, even though I don’t read from the script at the actual final presentation. I haven’t written the text for the defence talk, but based on that weak area of transitions, I am thinking that maybe I should. I guess I didn’t want to write a speech because I feel like I have been over this material so often that I want the talk to be more fluid and natural (like a rehearsed conversation). However, with the 20 minute time limit, I need those transitions to be very tight, so I think I need to write a speech to learn those key transition sentences (my plan today and tomorrow). Practice makes perfect so I will try rehearsing in front of the mirror out loud a few times, and maybe to a few more friends. I think now I actually want more help on the question part of the event (which is really the most important part of the defence). Although the presentation still needs refinement and practice I am proud of 2 parts in particular: the first slide and the last slide. I open with how P is in the news and thus a current concern, not something from the distant past or for the far future. I end my talk about making cities into brightspots of P management instead of simply hotspots of P cycling on the global landscape (which makes me think, I can’t wait to see what the wonderful Future Earth project lead by my advisor on brightspots will find). I feel like I am starting and ending on catchy notes. I am also reviewing my thesis document as a whole so that I am prepared for questions after the presentation. I am very sad to report that I have found typos…….. After all the work of reading and rereading and getting the computer to read it to me….. still punctuation and missing word typos. It is upsetting but there is nothing I can do about it except correct them for the final version now (I am using track changes as I go through the document now). Over the past couple of weeks I have also managed to finish (well almost finish) the revisions necessary on 2 of the 3 manuscripts we had sent out before the thesis submission. Although I was a little sluggish starting, the revisions were not that hard, and I think will make both papers stronger. In both cases it was about framing and writing, and not about the data or analysis themselves so it was all doable in a reasonable amount of time. 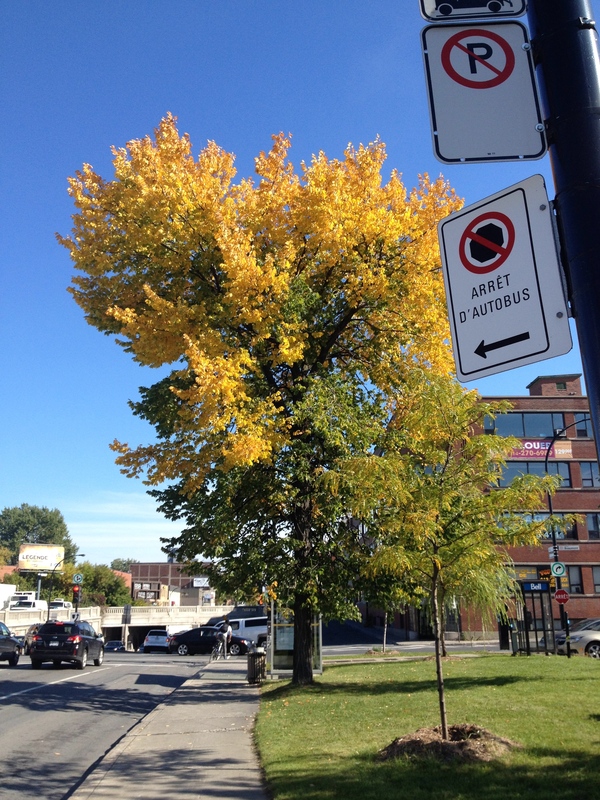 The trees are changing colour as we enter fall in Montreal. A little like the academic transition time I am going through this season…..